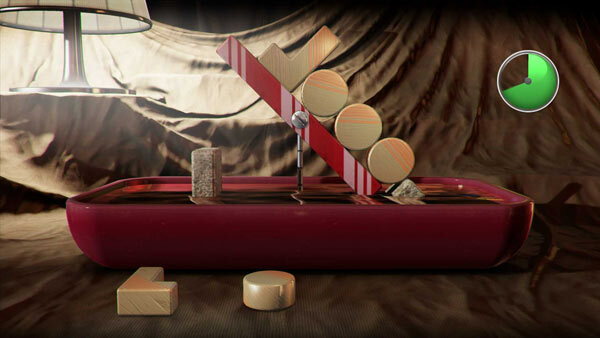 When I first saw Art of Balance by Shin’en Multimedia I thought it looked interesting, I love puzzle games and it looked great. What I found that I actually had was an amazing surprise. Let’s start off with gameplay. This is first and foremost a puzzle game and the controls are pretty basic. 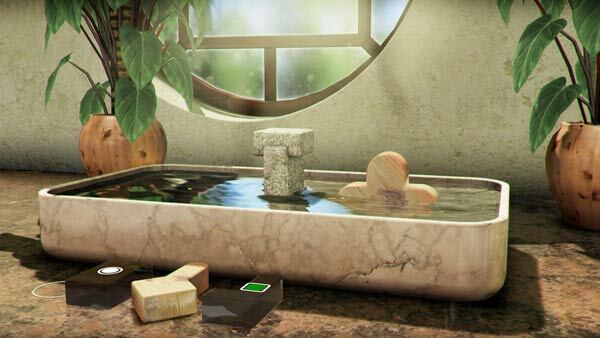 You have a lovely water basin in front of you with a stone protrusion that’s pre-built. You then have wooden blocks laid out in front of you. You’ll need to stack those blocks so that they don’t fall over in the water. Sounds pretty easy right? It’s a basic concept with complex execution. It’s basic at first til you understand how it works then it gets complicated and fun. Wait until you see the pressure blocks in world 2. There are glass blocks that can only have a certain amount of blocks stacked on it before shattering.There are also a variety of orange block levels that are “Challenge” levels in each world, they are tricky but award you with double points to unlock other worlds. This is the fun challenge heading your way and it gets better. You can play this strictly on the gamepad or TV. I opted for TV since this title has beautiful graphics. You hover over a shape, click it and then you can use the L+ R bumpers to rotate that said shape before placing it on the stone or on top of another block. The graphics are HD and are beautiful from the blocks to the, water, stones, and things laying around the level. The graphics are beautifully rendered and the water looks extremely real. 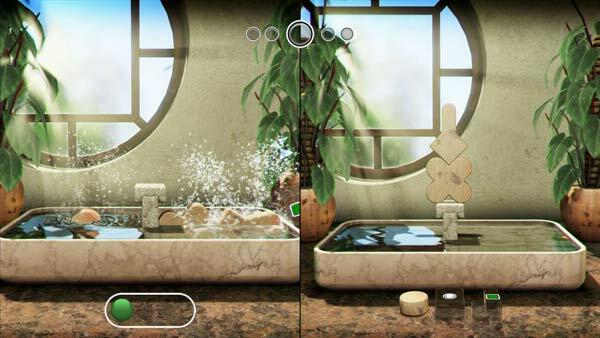 The level and water almost have a photo realistic quality which I highly enjoyed. Every time you drop or place a block you hear that deeply satisfying wooden clink. Maybe it’s me but I’m easy to please. The music is done rather well too. It helps add to the gameplay and you wind up concentrating and not even thinking twice or feeling rushed by the sound. It’s actually quite zen music, it’s jazzy energetic yet relaxing and fits in perfect to the gameplay. Let’s talk about some awesome features of the game that make it a 9 in my opinion. There are over 200 levels of single player campaign (Worlds A-H), that’s a lot of worlds to complete. The content doesn’t end. There is, drum roll please, co-op Multiplayer modes (2-5 players), also split screen versus multiplayer modes (2-5 players) and last but not least Online Play (2x 1-4 players, on two consoles). This is a lot of content that can either be enjoyed alone or with friends and family. If my above review didn’t make you already go check it out then I highly recommend checking out Art of Balance on the Wii U. There is a lot of content, it’s solo play or multiplayer options will give you high replay value and it’s darn fun and addicting not to mention challenging. is it worth the $8.99 in the eShop? In my humble opinion, yes it is.